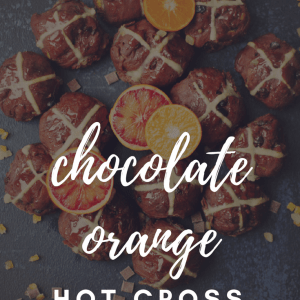 This week I’ve been making double chocolate orange hot cross buns. It’s always nice to have something I can offer unexpected guests and each batch I make keep for several days in a tin (that’s if my family don’t devour them first, of course). I was in two minds whether or not to ‘mess’ with my traditional hot cross bun recipe. 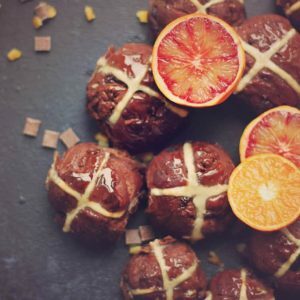 I’m not really a fan of the flavoured ones the supermarkets bring out but there is something quite irresistible about a squidgy bun oozing with chocolate, so I turned my recipe into a double chocolate version and added orange flavourings for an indulgent twist on an Easter favourite. If you enjoy the chocolate orange flavour combination then you will absolutely love these! 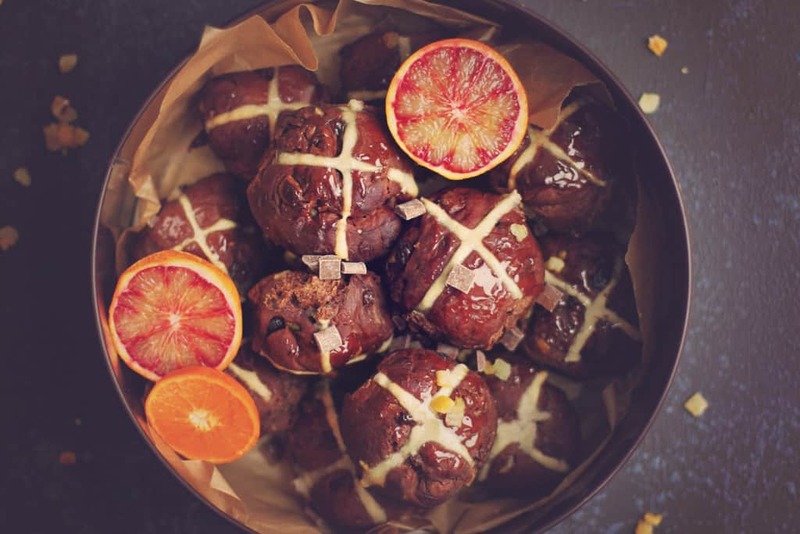 Hot cross buns are traditionally eaten on Good Friday to mark the end of lent, each ingredient signifies different meanings including the cross on the top that represents the crucifixion of Jesus. Most of the time in the UK hot cross buns are available just after Christmas (as are Easter eggs!). 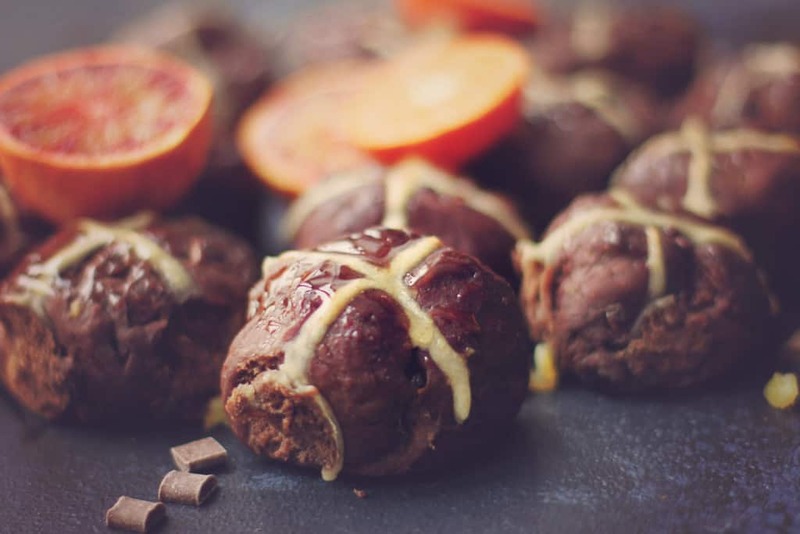 An indulgent twist on one of the nation's favourite Easter treats. If you like the chocolate orange flavour combination then you will love these. To make the dough warm the milk and butter in a saucepan, keep an eye on it to ensure it doesn't boil. When it reaches a simmer, stir in the orange peel and orange extract and remove from the heat. Mix the flour, cocoa powder, yeast, sugar and cinnamon in a large bowl. Add the wet ingredients to the dry and mix, adding a tsp of salt. Add the egg and give everything a good mix with a wooden spoon. Tip the dough out onto a lightly floured surface and knead for around 10 minutes. You are looking for your dough to turn from sticky to smooth and elastic in texture. Once doubled in size, turn the dough out onto a work surface and spread it out with your hands. Add the raisins, citrus peel and chocolate chips and work them into the dough by folding the dough and kneading them in. Put the dough back into the mixing bowl, cover with clingfilm and leave to prove for another hour. Mix the flour and the water until you have a smooth paste, spoon into a disposable piping bag and snip the end off. Pipe a cross over the top of each bun and bake in the centre of the oven for 20 minutes. Melt the butter and maple syrup for a minute or two in the microwave. Mix together to combine and glaze the buns as soon as they come out of the oven. Use a pastry brush to spread the glaze over the top and down the sides of the buns to ensure they stay soft and springy. Double chocolate hot cross buns can be kept for 3-4 days in an airtight tin or container. They can be frozen but thaw them for a couple of hours at room temperature before warming in the oven or toasting them. If making in advance you can freeze the uncooked dough after the first rise. Shape the rolls and put them on to a baking sheet lined with baking parchment, cover them loosely with clingfilm and freeze immediately. When you're ready to bake the rolls you will need to transfer them to a greased baking sheet and cover loosely with a damp tea towel. Leave in a warm place to thaw and prove - this will take between 3 and 5 hours but does depend on the temperature of the room and the size of the buns. Once thawed out and proved, bake the buns following the instructions in the recipe. 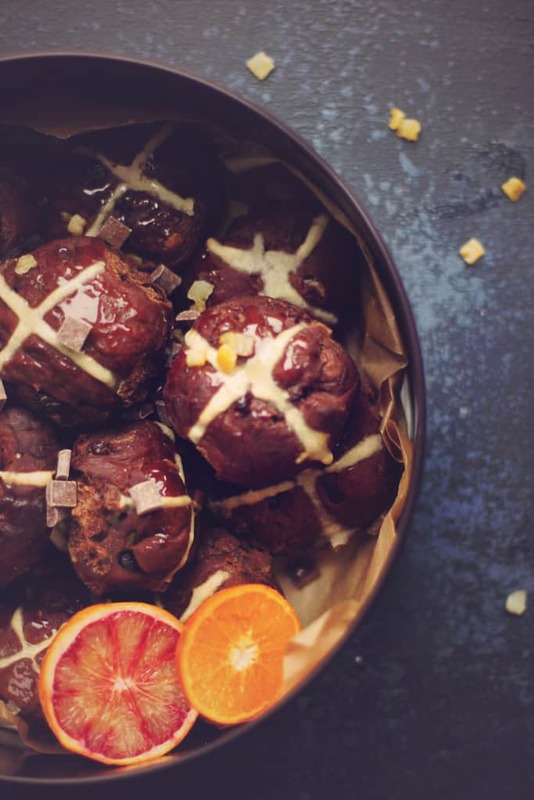 As I’ve mentioned these double chocolate orange hot cross buns will keep for several days in an air-tight tin and you can slice them in two and toast them or pop them in the oven for a few minutes to warm them through. I like mine topped with a little butter or tart cherry jam goes nicely with them too. How do you eat your hot cross buns? Do you prefer the traditional ones or do you like to play around with different flavour combinations? I’d love to read about your favourites in the comments. If you enjoyed this Easter recipe why not have a go at making my Easter cake showstopper! Previous Post: « Easter cake showstopper recipe!